Over time, my Itech Concept II full face shield became scratched. It wasn’t really the shield’s fault either. Most of the time, I’d carelessly toss my helmet into my bag along with my other gear. I’m not one of those guys who carries his helmet in a microfiber pillow case. Although I devised a cheap method for keeping the shield fog free, the scratches created a haze of their own. Besides, the plastic bars on the lower half of the mask threw me off. I need consistency. My eyes didn’t like adjusting from window to cage. I’m too chicken to use a half-shield, so back behind bars I went. The Bauer FM 3000 has been my trusty cage for awhile, but it’s a little districting. On a quest for the perfect cage, I decided on the CCM FM480, chrome edition. I rock a white Bauer HH5000L. Lucky for me it was listed the on compatibility chart as a match for both a medium and large size cage. Because I have a large helmet, I ordered a large cage. That was a mistake. The width fit fine, a little narrow actually. However, the cage extended too far below my chin. As my face is not shaped like Jay Leno’s, I returned the cage for a medium. Exact same width, smaller length. It fit like a glove. The only issue I had was having to remove the small barrels that come pre-installed on the cage. Maybe these rollers are great for CCM helmets, but they only got in the way on my Bauer. I put the cage to use. The visibility was a vast improvement from the old Bauer cage. The bars were evenly spaced and didn’t have the double bar down the center. I found the chrome finish to be less distracting than the traditional black color. The only issue with the chrome occurred when it caught the light and glared in my eye. Other than that, the cage worked great. Now, during those rare moments I actually look up when I’m handling the puck, I have an improved field of vision. If you’re in need of a cage I’d recommend the CMM 480. 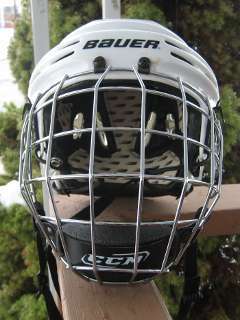 The only other cage I’ve heard great things about was the Bauer 9500/9900 oval facemask. I can’t vouch for it because I didn’t feel like spending $50 on a cage, but I’d be curious to hear from others who have tried both. This entry was posted on on April 10, 2011 at on April 10, 2011 and is filed under equipment, product review. You can follow any responses to this entry through the RSS 2.0 feed. You can leave a response, or trackback from your own site. I have the Bauer 9900 and the cage is worth every penny. Just as strong as any other cage, but the bars are thinner. This comes from the bar’s shape. They are not round, they are oval. Looking down on the bar, the top is wider then the side. So when you are looking out from the helmet you see very small bars. For round bars the top is just as wide as the side. For the oval the top looks like | | but when looking out all you see is ||. Pretty much think of a circle that has been pushed smooshed from the top and bottom. After using your new cage for a couple months now, how do you like using it compared to your old Concept II full face shield? It’s worked out well. It’s just nice being able to throw it in my bag and not worry if it will scratch.